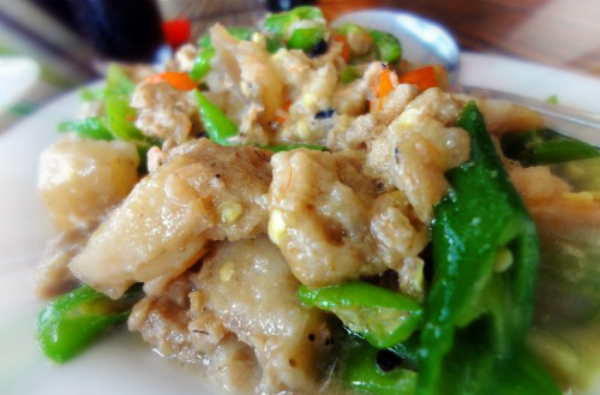 Bicol Express is a filipino dish, mainly in the region of Bicol. This spicy dish is mainly consist of bagoong or balaw (fermented shrimps), coconut milk, garlic, onion, ginger, and of course, red and green chilies. Traditional Bicol Express got less meat, more alamang, more siling haba and siling labuyo. 1. Combine coconut cream, pork, garlic, onion, ginger, salt and pepper in a heavy bottom pan. Stir continuously over medium heat until coconut cream is almost dry. 2. Add kakang gata, alamang, sliced siling haba and siling labuyo. Stir constantly until coco cream is thick. 3. You have the option of drying it more in low heat. This will extract the coconut oil making your dish "nagmamantika"